Ariel Chen isn't your stereotypical over-the-top wedding planner. She won't push you to print a stack of cheap and tacky invitations, or persuade you to order a bunch of hideous flower arrangements. She doesn't even like the color pink. So, don't expect her to give you a cookie-cutter wedding - unless, of course, that's what you want. "I don't believe in all the fairytale things," says the 28-year-old wedding planner. "But, I can custom-make all the things you want that will symbolize you and your groom." The Chinese-Canadian recently started her own wedding planning company in Shanghai after moving to the metropolis three years ago. While the city offers cheaper competition from local wedding planners, Chen hopes her Western approach to wedding planning will help win clients over. By tailoring wedding details to the soon-to-be bride and groom, she's able to offer couples a more personalized wedding. "It reflects who they are and gives them a wedding that belongs to them, not just a wedding anyone can have," Chen says. "It shows what they like, how they think, and it's sweeter this way." Still, wedding individuality is a relatively new concept in China, and it has yet to really penetrate the local market. 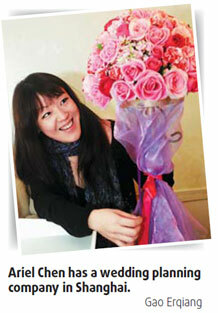 For this reason, Chen admits her style of wedding planning is often a tougher sell among locals. She says local couples are used to Chinese wedding planners who "pretty much stereotype everything for you and give you a one-stop service". But, not all Chinese couples want their weddings planned this way, she says. Chen believes locals are ready for a more Western-style approach when it comes to planning their wedding. Chen never meant to become a wedding planner, nor did she intend to bring Western-style wedding planning to the Chinese mainland. Born in her parents' native Taiwan, she lived there until the age of 12 before moving to Singapore. At 15, she made her way to Canada, where she completed a political science degree at Simon Fraser University in Vancouver. Despite her ambitions to become a lawyer, she maintained an interest in the world of art and design, studying fashion merchandising and makeup artistry alongside her university studies at the Blanche Macdonald Centre. Encouraged by her father to move to China and try her hand in the market, Chen found her way to Shanghai in 2005, where she dabbled in advertising before opening Galaxy Image with a partner. Putting her creative background to use, she formally reopened the business as a wedding planning company. Chen's company has yet to turn a profit. She says one of her biggest challenges is meeting the discrepancy between local prices and hers, which are higher in order "to maintain a certain quality". "The most challenging thing is to get the clients to trust me and realize I'm not actually making a lot of money," Chen says. "They don't realize how expensive things can be, especially in China." Even so, she believes her business can become something of a "wedding empire" one day. Until then, she's not in the wedding planning business just to make money. "There aren't many people who are willing to give you such an important job," Chen says. "The couples are actually giving away their most important day for me to run." "I'm there to witness their wedding day, and that's really meaningful," says Chen. "I want the couple to remember me because it was a great experience. And, I know it's cheesy, but I think it's a calling that I'm there for them."